Wanted: A top-notch, slow-talking fundraiser willing to move to Arkansas. Former Gov. Mike Huckabee on Friday blamed campaign finance laws and a failing within his own campaign for his poor fundraising record. He hopes to fix things by recruiting a national finance chairman who fits the aforementioned description. "I don't want some fast-talking, slick guy. I want somebody who believes in me," Huckabee said, before joking: "That's the hard part: finding somebody who believes in me." Huckabee raised about $1 million this summer for his GOP presidential campaign, one-tenth the total of front-running rivals Mitt Romney and Rudy Giuliani, and one-fifth the total of little-known Rep. Ron Paul of Texas. The former Arkansas governor said he's raised enough money to stay competitive and build on the momentum from a second-place finish in Iowa's straw poll and a modest rise in polls. But he acknowledged that he's off to a slow start on money, saying the problem is that he hasn't had a national campaign chairman overseeing fundraising efforts. 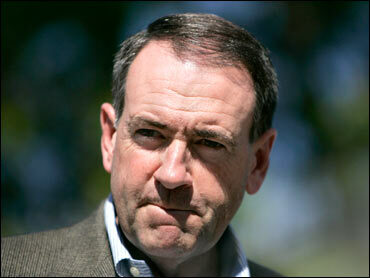 Huckabee blamed campaign finance laws that he said favor rich candidates and Washington incumbents. "If I was wealthy, I could have hired somebody to find a lot of people to give me money. If I was a senator, I could have transferred a lot of money (from Senate campaign accounts) to hire somebody to find a lot of people to give me money," Huckabee said. While his rivals often fly private planes that whisk them to three or four fundraising events a day, Huckabee goes commercial. "I've spent a lot of time in airports with canceled or delayed flights," he said. His original finance director had to leave the campaign for personal reasons. Huckabee suggested that it had been hard to find a replacement because political professionals underestimated his staying power. Now his campaign is drawing more interest from donors, including a group of 100 pledging to raise $100,000 apiece, so it should be easier to find a top-notch national finance chairman, Huckabee said. "We've got to find somebody who is interested in moving to Little Rock and raising money," he said.